Hampi is a small village in the northern part of Karnataka. It is known as World Heritage Center due to the ruins of the Vijayanagar Empire. Lot of tourists visit this place to see the monuments and temples present there and cluster of villages near by. 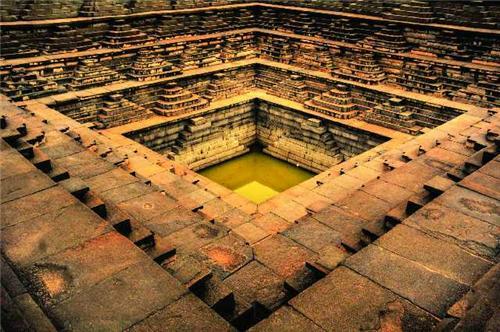 Hampi has three major centre to be visited as localities The Sacred Centre, The Royal Centre, and The Islamic Quarter. The other localities which are present are Hospet, Kamalapura, Hampi Bazaar and Anegondi. As the name suggests this area marked by the river on the northern boundary of Hampi is a religious centre. It has lot of temples of which some are functioning and some others are in ruins. The famous Virupaksha Temple, Vittala Temple are to name a few. This is very close to the Hampi bus stand. This is a place where lot of pilgrims and backpackers camp and do rituals and meditation . Therefore this locality is known for temples and divinity. The Royal Centre was once the place occupied by the royals of the Vijayanagara Kingdom which has gone to ruins. The main road which passes from Hospet crosses the Royal Centre and reaches at the Sacred Centre. The area is filled with courtly and military structures like forts and palaces. Some of the most visited monuments that one can find here are the Elephant Stables, Hazara Rama Temple, Lotus Mahal, the Queen's Bath and the Royal Enclosure. 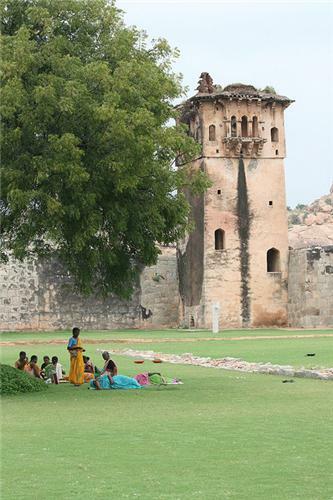 This area is known to be the residential area of the Muslim community during the Vijayanagara Empire. The officers of the court and army who were muslims did stay together in this area The road that connects Kamalapura and Vittala Temple passes through this area. Some of the tombs, and mosque structures are seen in this area. One of the well known Mosque is Ahmed Khan's Mosque and Tomb. Kamalapura is considered as the main junction from where roads branches out to various parts of Hampi. It is a tiny crowded suburb area just outside Hampi. The Archeological Museum is situated in kamalapura. It also has some old monuments and temples which is a must visit at Hampi they are Pattabhirama Temple and domed gateway to name a few. The state run hotel is one of the few luxury facilities in Hampi which is found here. This was the capital of Vijaynagara Empire long before the chiefs made Hampi its capital. One needs to cross the river from Hampi to reach Anegondi which is a bustling village square. This is the most laid back area of Hampi. The riverside areas of the west of the village square are the main huts for rental scene. Very few resort like places are there for visitors to use. Some of the best monuments are there like Hanuman Temple on the hilltop and Ranganata Temple at the village square to name a few. Known as Virupaksha Bazaar, the street is located in front of the temple, along the east end is the Matanga Hill. Both the sides of the street are lined with series of old pavilions and some of them are storied. These were once part of the thriving market and resident of the nobles. Two wheelers can move around freely and are regulated. At the end of the road a huge Nandi (bull statue) is located. Photo gallery is functioning with various photos of Hampi being taken by old rulers which are put for display. An open platform which forms the stage for Hampi Festival is there at the end of the road.